This is a converted Tesco TE7 Timer as described in our article Convert Digital Mains Timer to Low Voltage. It is supplied with a bespoke relay board which can switch up to 10 Amps of current at up to 30VDC. 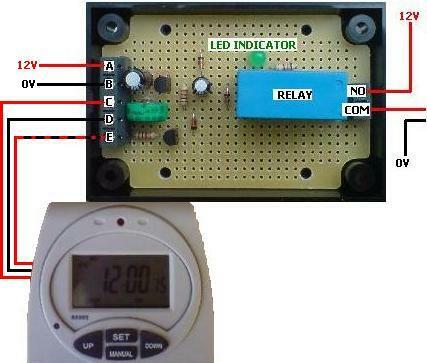 This combination of timer and relay board gives an enormously useful and affordable 12V programmable time switch. This timer and relay board combination is designed for use with a 12 Volt DC power source – either a 12V battery or a suitable mains transformer. (Contact neil@reuk.co.uk if you require a 6V or 24V powered system). i.e. 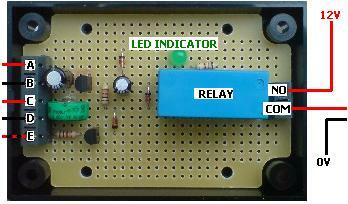 the relay switch is closed (current will flow through it) only when the relay is energised by the signal from the converted timer in its ON state. Whenever the converted timer is ON – either because user has selected the MANUAL ON mode or because it has come on automatically due to a user-entered programme, the green LED will light up and the relay switch will close. This will connect the load device – lighting, pump, etc – to the power source turning it on. When the converted timer is OFF. – either because the user has selected MANUAL OFF mode or because it is programmed to be OFF, the green LED will be turned off and the relay switch open. This disconnects the load device from the power so it too will be off. This conversion is fitted with a small backup NiMH rechargeable cell which will enable all stored programmes and the current time to be retained (for over 100 hours) if/when the 12V power source is disconnected. This cell is automatically trickle charged when the circuit is connected to the 12V power source so it is always ready when it is needed. The Tesco TE7 is a 7 day programme electronic timer with a random function and 10 ON/OFF programmes which can be set to 1 minute accuracy. The user can select either MANUAL ON, AUTO, or MANUAL OFF mode for total control. This timer even has an easy to use summer time mode which makes it quick to change to time when the clocks go forward for BST. The timer is supplied with its original instruction manual, and setting the programmed ON and OFF times is very simple.